The Office of the University Registrar is happy to announce that as of the June 2016 diploma order, Certified Electronic Diplomas (CeDiplomas) are available to our graduates to purchase through a partnership with our diploma vendor. The CeDiploma is a secured, certified, electronic version of the UW diploma. It has an assigned 12-digit CeDiD validation number that employers, embassies, and other validating entities may use to verify the credential by entering the validation code into the University of Washington CeDiploma site. 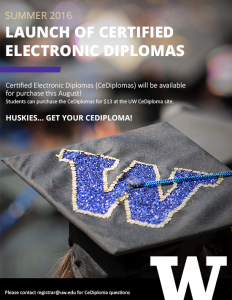 As an official, portable and verifiable electronic version of the UW diploma, the CeDiploma provides many invaluable services to our students, particularly those applying to schools or jobs overseas; medical students applying for their medical license; and students looking for a portable, easily accessible diploma. Stanford University was one of the first universities to offer the CeDiploma to their graduates, and they have experienced great success with the deployment of the electronic diploma. CeDiplomas will be available for degrees with a conferral date of June 2016 or later. The CeDiploma is created when the physical diploma is printed. Students can reserve or purchase a CeDiploma for $10.95 at this site. More information about CeDiplomas can be found at https://registrar.washington.edu/cediploma/.